Looking for deeper insight on markets? In tonight’s Closer sent to Bespoke Institutional clients, we discuss equities’ prospects of continuing on to new highs given that major indices are beginning to press against their 200-DMAs (an indicator that has proven to be tough resistance in the current drawdown). We also take a look at how EPS estimates have begun to shift. Next up, with the US Census finally releasing trade data for November after the indicator had been delayed due to the shutdown, we take a look at the decline in the trade deficit. Staying on the topic of trade, Chinese trade balance data was also released today which we provide an update to and what these trade balances could mean for growth. 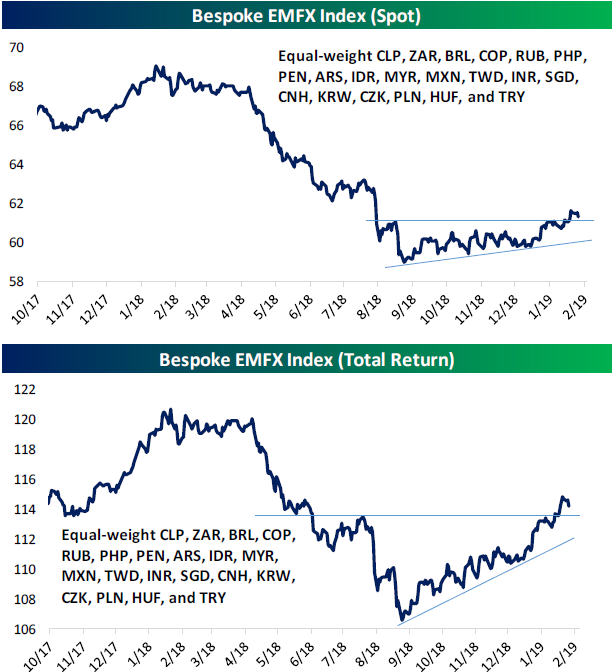 We finish by taking a look at the pullback in EMFX as well as what a few asset markets—including the euro-Swiss franc and a composite of nominal 10 year yields from around the globe—are indicating about the global economy.